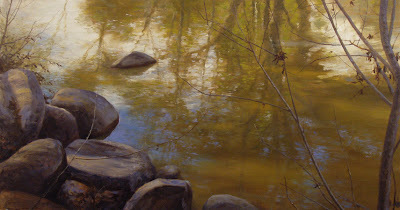 Oil on board, 24.5" x 48"
A painter has to be able to really "see" colors and shapes to paint reflections and shadows together. You did a wonderful job! I love the reflections in the water. Thanks, Kim. This is a rather strange, kind of "leggy" design, that I kind of like nontheless. I put quite a bit of effort into trying to make the water's shadows and reflections appear effortless. I'm happy you think it works. This is really lovely work Don, the rocks, the shadows, the reflections, all beautiful - well done! I enjoy how you find a peaceful scene and manage to make an arresting image from it. I don't know how you do that. I imagine one thing is not forgetting that first impression when you first lay eyes on a scene. Hi Silvina, that's really nice of you to say. I think what success (or at least unusual character) there might be in this painting is partly due to the fact that one views the painting quite a bit like one would see the scene itself. What I mean is there are competing focal points, no single center of interest. And, for me at least, the branches on the right function quite a bit like reality in that if I look at the water, the branches kind of disappear from focus, and vice-versa. This is advanced composition. I think the branches disappear when looking at the water because when I squint, they are about the same value. Visiting your blog is always an education. You're quite right, Silvina, I think the closeness of value has a lot to do with it. At the time I painted it, I recall being bothered that I couldn't create enough contrast between limbs and water, but now I think I prefer it that way. This is just gorgeous Don. It instills a real feeling of peace in me while I'm looking at it. Brilliant work! Careful, Melody, you'll just encourage me! Thanks a lot for the kind words.